This year Cam and I attended Scott Kelby’s Worldwide Photo Walk on October 13. We joined the walk in Winchester, Virginia, and spent a wonderful afternoon photographing Old Town Winchester with a group of like-minded and enthusiastic photographers. Cam and I could each enter a photograph in the contest with the 30,000+ other walkers, and I chose this one because it really brought me full circle. 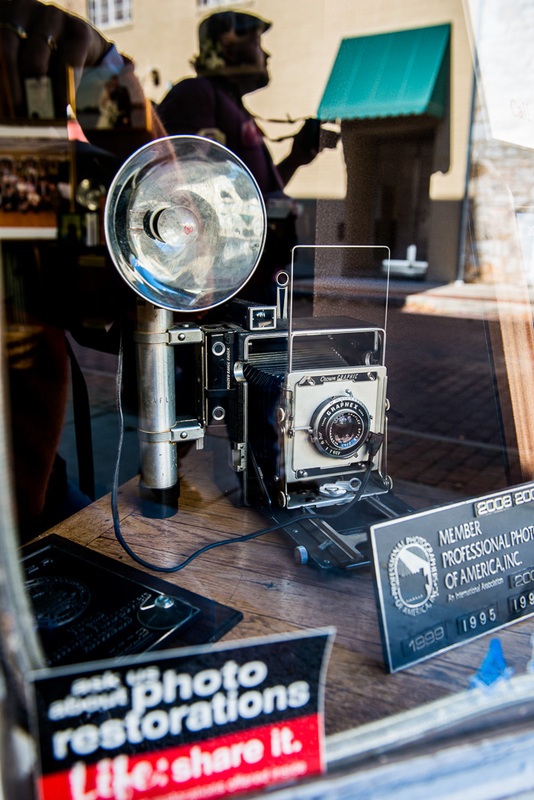 As we passed this storefront, with an old camera in the window, it reminded me of my start in photography. I recall my grandfather having a similar camera, and I used to love to hear the pop of the flash bulb when he took a shot, and I’d race over to him and ask to hold the spent bulb. I’d juggle the hot bulb in the palm of my hand while he inserted another, and then when it was cool enough I’d give it back to him to recycle. I love the reflection of the photographer in the background, searching for his next shot, with my hand and camera to the left. And, what’s really awesome to me, is that the image is reflected again in the lens of the old camera. Photography brings new and old together in harmony, always on a mission to capture that next special moment in life. Oh my, this photograph is fabulous. I really appreciate a piece of artwork that keeps calling you back and you see more each time you look. This should definitely be a winning entry if there is indeed a contest.